All ye landlubbers might have noticed that it’s talk like a pirate day today. Normal appearance will be restored shortly. Homework for 15 September is to complete the problems on page 7 of the homework booklets I gave out on Tuesday. We have recently reviewed AC & DC as part of the traffic lighting exercise, so you should be able to tackle these without too much difficulty. We looked at different types of lamp today, including filament lamps, neon & argon lamps, mercury vapour lamps, sodium lamps and fluorescent tube lights. The wikipedia site has lots of information about different types of light. See if you can find out how a halogen lamp works. 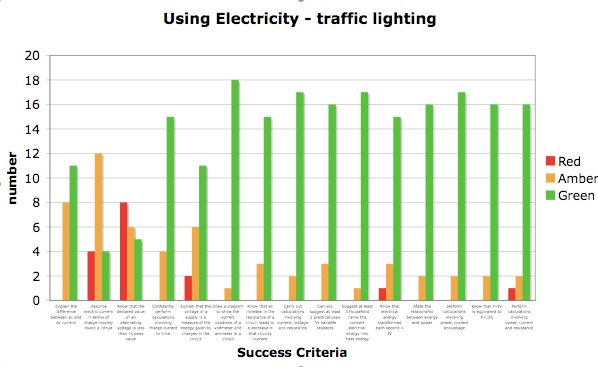 I’ve used the traffic lighting information you provided in your jotters to draw a bar chart showing how comfortable our class feels about each of the success criteria. If you want to read the text along the x-axis, just click on thisÂ pdf version of the traffic light chart. You will be able to zoom in using Acrobat’s zoom feature and read the full text label for each of the criteria (get Adobe Acrobat Reader here). I will address the topics attracting the highest red scores first, so we will start with “know that the declared value of an alternating voltage is less than its peak value”. We will start a lesson with this topic in the next week. Please bring back the problem booklet and your completed homework on Tuesday 29/08. We looked at the relationship between current, voltage and power in our last lesson. The good people at howstuffworks.com have an excellent page that summarises this topic – click here to check it out.